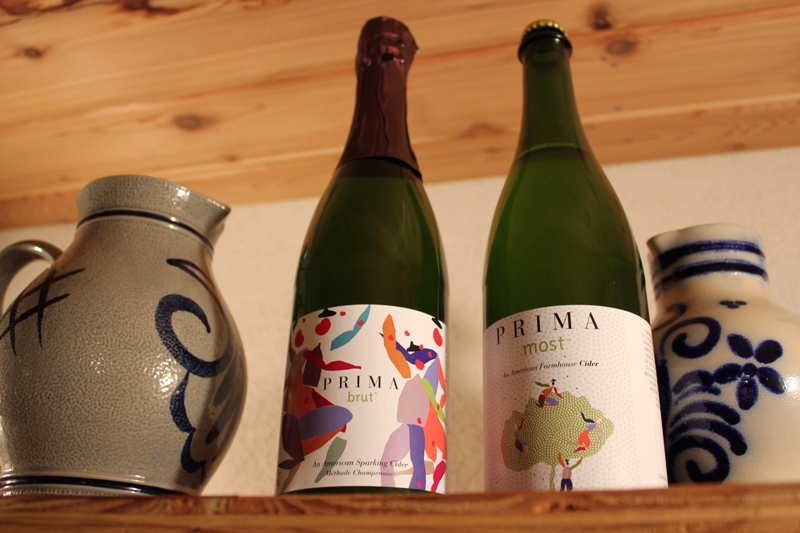 With roots in German farmhouse cider, Prima Cider, located in upstate Illinois, is working hard to provide—and educate—its local market with the richness of old world cider. 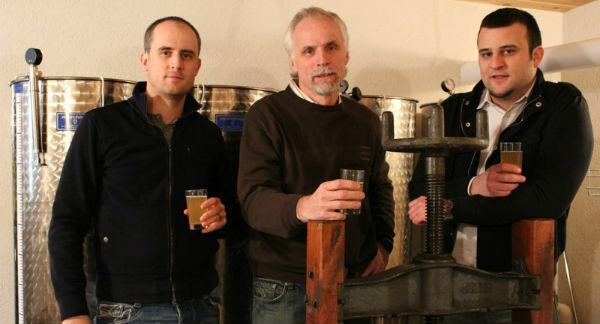 Just north of Chicago in Long Grove, Illinois, four men of the Bertsche family—Richard, Erich, Tristan and Martin—are continuing a German family tradition of making farmhouse cider. Prima Cider is cleverly positioned in the “part city, part country” semi-rural area of Long Grove. The cider is made in the Bertsche family home and an adjacent building to the house, with an underground cellar that is used as a fermentation and cellar area. 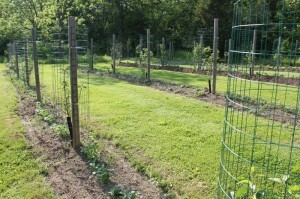 A small orchard adorns the property, filled with selected apple varieties for future cider and blending experimentation. Prima Cider started commercial production last year and have plans of expansion once cider awareness increases in their Illinois local. Always a fan of the family, start-up ciderhouses—well just learning about new ciderhouses in general really—I was excited to talk to the Richard and Erich Bertsche about their German cider history and why they started the ciderhouse. Why the name Prima Cider? Rich Bertsche: Prima in German means excellent as in “schmeckt Prima,” tastes great and in Italian it means first. At first we thought Prima Cidre and in the end we thought we are American and want to produce great American ciders with if you will German underpinnings. The words Prima Cider just seemed to go together. Erich Bertsche: We felt that we wanted a name which stood for a premium product as well as reflect the fact that we were one of the first on the scene in Illinois. When we started the company early last year we were the only local producer of craft cider in Illinois. Why cider? From your website there seems to be an interesting history behind your cider, can you describe it to us? RB: In our family cider was always part of our culinary traditions. Most people think of England or Normandy for cider and sometimes Spain but Germany also has a cider tradition. My grandfather in Southern Germany, had presses and milled and pressed the cider for the local farmers. They brought their apples; he pressed the juice that the farmers then took home to ferment. It was the everyday drink that every farmer had year round. I think this was not unlike the farm experience in the early 1900’s in the U.S. As a child our family lived for a year with my grandparents in Germany and I had (hard) cider everyday with my grandfather for lunch and evening dinner; this as a fourth grader. You could say I got hooked at a young age. Today it still is common to get a good cider (known as Most to use) in certain areas of Germany. I started making cider in 1980 when I had my first home together with my father. I had a small cellar area as did he. That allowed us to cold cellar cider. My three boys grew up with cider at home. For dinner they would go down to the cellar with a jug that was filled and consumed for dinner by all. When friends and family came over for dinner the evening always started with cider. It was the unfamiliar drink everyone enjoyed. Over the years, many acquired a taste for the dry natural cider we made and ultimately their encouragement resulted in our decision to commercially produce cider. EB: We grew up drinking cider and absolutely loved it. In recent years any time our family got together and one of our ciders was placed on the table that was all we could talk about. We started to play with labels on our bottles and a lot of our friends started to get into it as well. In 2009 I was in Italy touring a small winery, which was run by two friends of mine. I was inspired by the hard work and passion they put into their wines. I thought to myself, we have to create that same type of energy with our cider and that was it. We decided to start the business shortly after. Who does what in the ciderhouse? 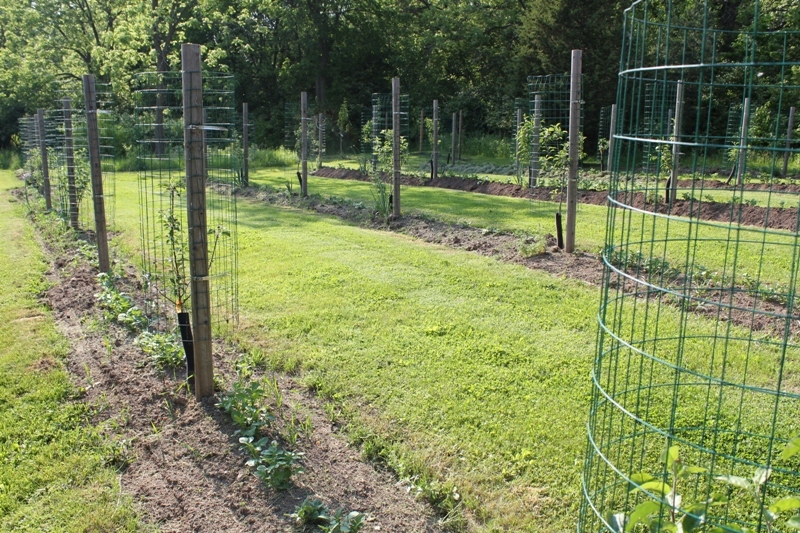 Orchard in Long Grove, IL where Prima Cider has selected specific apple varieties of interest that they plan to use to experiment and to blend. RB: It’s a shared responsibility and when we are racking, bottling and similarly it becomes a family weekend event. It’s very much a family affair. Over the years I have scouted and located many of the orchards in Wisconsin, Michigan and Illinois that have the apple varieties we are looking for. Over the years we’ve also experimented with different apple varieties because the apples available in the U.S. are not those available in Europe and also the climate is different in the US. Often the same apple varieties taste different here. Erich, Tristan and Martin have taken on a passionate interest in cider and has become something we can do together which make it fun. Erich handles marketing, Tristan and Martin help in the production and we all are active tasters. EB: Richard is the cider master from choosing the right mix of apple varieties, yeasts, and determining the right blend for each of our products. I have concentrated on the marketing aspect. But at the end of the day we all to pitch-in and wear many hats, especially since we began offering our ciders commercially last year. What types of cider do you make? Do you try to focus your cider on a specific origin of ciders or is it a mixture? If so, what? RB: We make a cider, Prima most which is a very much a farmhouse still cider and we also make it with a small amount of natural carbonation. We have a Sparkling Cider, Prima brut that we make method traditional (champenoise). Controlling the type of apples used unfortunately is subject to availability from local orchards and so the cider can vary considerably. We only use late fall (early November) harvested apples that are fresh pressed. We make our cider virtually sulfide free and use no other supplement other than cider yeasts. Our ciders are fermented in stainless steel tanks so as not in any to tamper with the flavors imparted by the cider alone. Fermentation is always complete; the cider is dry the way we think cider should taste. Our personal favorite is a cider with no carbonation, served from a barrel, poured into a glass at a distance from the spigot allowing the cider to aerate and create its own effervescence. 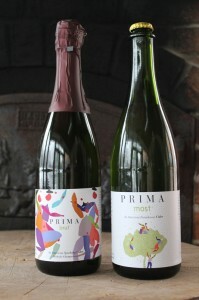 Prima Cider dedicates itself to its Prima Most and Prima Brut ciders, both with a German background. What apples varieties do you use and why did you choose them? RB: Apples varieties of choice are Golden Russets and Russets in general, Winesaps (old varieties), Arkansas Black, Nothern Spy and when available Bramley’s Seedling, Ashmed Kernals, Calville Blanc D’Hiver. We use quite a mix, subject to availability. There are noticeable variances in the taste of cider even when you use the same variety. Our cider year to year can be quite different in taste based on the availability of apple that year and on the seasonal variations in climate and weather. We contract our apples and have developed a relationship with various growers so that we can better guarantee availability. In the U.S. there is a growing interest on the part of growers to plant other apple varieties (non-dessert apples) for use in cider, which has been a good thing for us. How do you feel your product is different from those already on the market? RB: We feel our product is different, governed by the quality of apple varieties we use, the way we make it, the non-sweet character of the cider we strive for and the way it is served. It is an education process. Unfortunately most people think of cider as a sweet product and as a close friend of mine stated observed “Every cider I’ve purchased has reminded me of 7-up and apple juice.” In our own way we are trying to change that perception. EB: Most people that taste our ciders have trouble placing the country of origin, which we think is a good thing because we are trying to pursue a different direction.